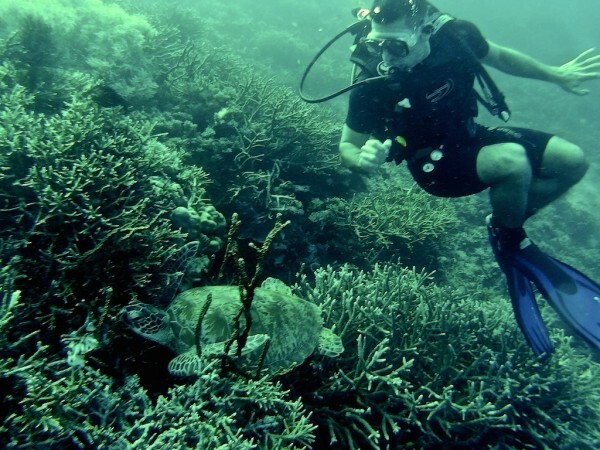 Indonesia is famous for having some of the best diving in the world, particularly due to its location in the Coral Triangle area, voted as one of the New Seven Wonders of Nature in 2011. 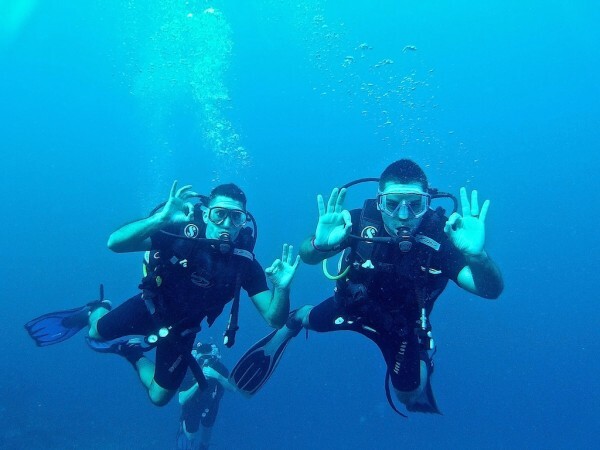 As enthusiastic scuba divers, we just had to come visit and swim with the turtles, sharks, parrot fish, clown fish, manta rays, surgeon fish, barracudas, trigger fish, moray eels and and… Yeah we're totally showing off, but for good reason. Oh this old thing? Just ANOTHER turtle who was totally following us in every single dive! 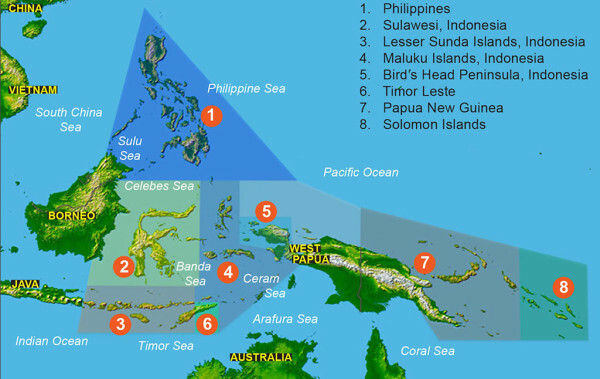 The Coral Triangle is scuba diving paradise because it is the global centre of marine biodiversity. For example it has 75% of the world’s coral species, 6 of the world’s 7 marine turtle species and 3000 marine fish species. The only problem, after diving here, your expectations will be completely blown and extremely hard to beat. 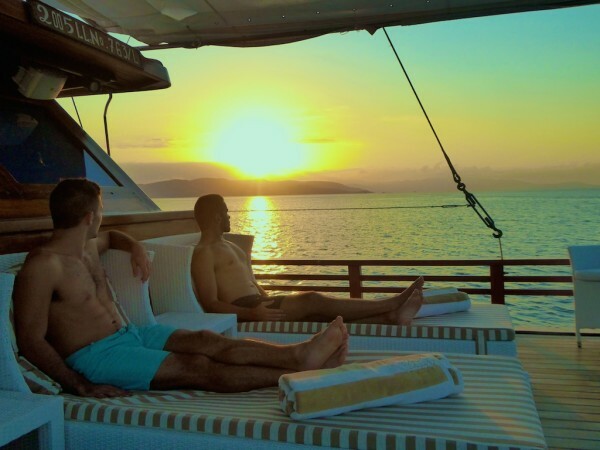 We went on a luxury liveaboard experience with The Samata in September 2015 around the Komodo National Park (Lesser Sunda Islands) and it was the experience of a lifetime. 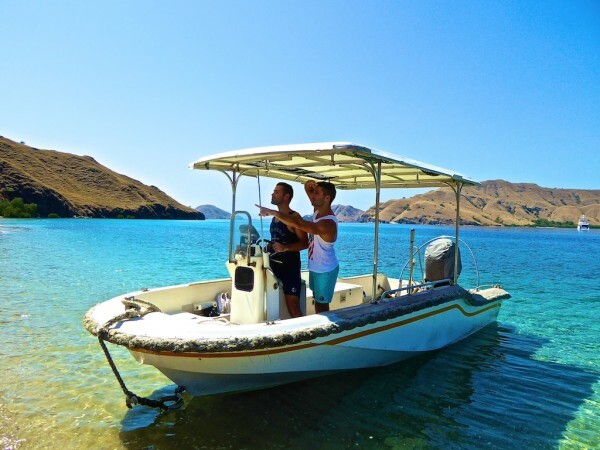 The Samata is a traditional Phinisi Indonesian yacht and takes chartered liveaboards around the Komodo National Park, with a focus on scuba diving, snorkelling, visiting remote deserted islands and meeting the famous Komodo Dragons. The luxury yacht is 42 metres in length, with 3 decks and a capacity of up to 10 people. Perfect for Sebastien's demanding high expectations! The Samata liveaboard experience is geared for scuba diving and snorkelling with excellent, new equipment. It has 2 speed boats attached to it at all times, ideal for short diving and snorkelling journeys when the Samata is anchored. This is what it was all about for us. 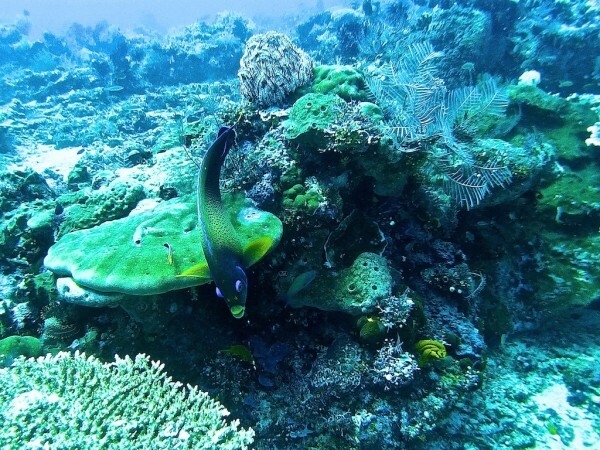 Diving in scuba heaven in the Coral Triangle. And with 2 speedboats, we could leave the Samata and visit the reefs which are harder to reach. The diving was mind blowing and we were completely spoilt. It got to the point where we were almost blazé about seeing another shark or another turtle, or god forbid, ANOTHER manta ray! A warning however: diving here will be one of the best you will ever experience, so everything after will simply pale into comparison. 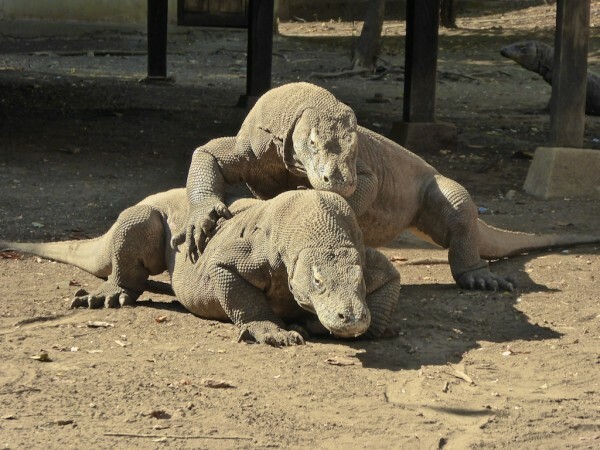 The Komodo National Park area is also famous for the Komodo Dragons, the largest living species of lizard on Rinca Island. We visited them as part of our Samata liveaboard experience and met the very charming Keith and Kenny, the new reptile Nomadic Boys. Unlike Stefan and Sebastien Nomadic Boys, Keith and Kenny can grow up to 2-3 metres in length. They gained the nickname of Dragons because of their dragon-like appearance and aggressive behaviour. Well, they do start out life quite tough having to run away from their mothers who try to eat them right after they've hatched! 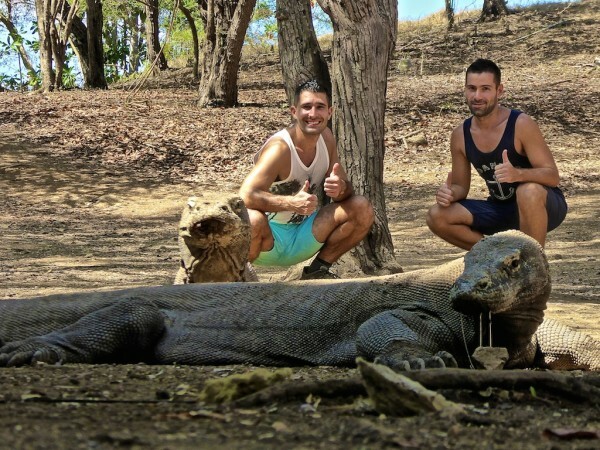 A visit on Rinca Island has to be with a guided tour by one of the park wardens who know how to manage the dragons and will help you stage some excellent photos with them. Keith and Kenny were quite keen to pose with us, although the saliva dribbling out of Kenny's mouth was a bit worrying. The National Park guards use long wooden sticks to manage the dragons to ensure they keep a safe distance. Unfortunately when a cheeky Stefan tried to creep up and startle an unsuspecting Sebastien, Sebastien confused Stefan for one of the dragons, grabbed the park warden's stick and tried to fight off poor Stefan! 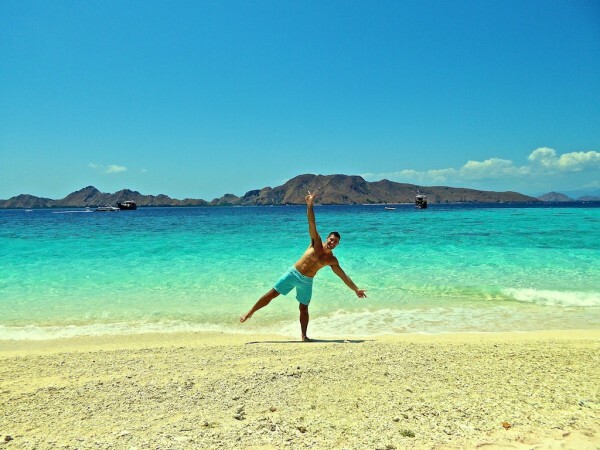 The Komodo National Park area is formed from a variety of 29 volcanic islands across a surface area of 1,733km². 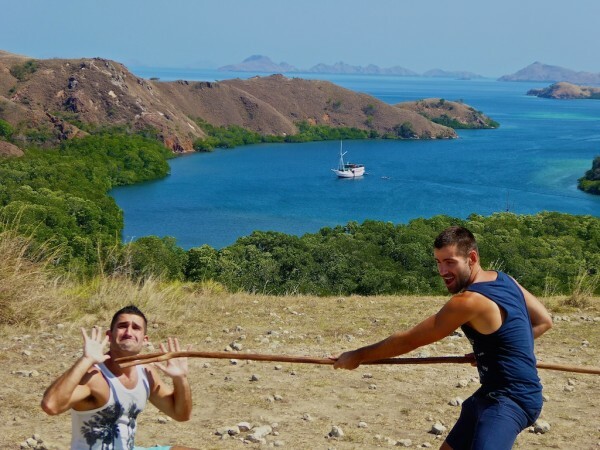 The 3 major ones are Komodo, Rinca and Padar and alongside these, there are 26 smaller islands. Not all of the smaller islands are easy to reach with a yacht or large boat, however, the Samata sails with 2 speedboats to hand, which meant we could anchor the Samata and visit the smaller, more remote islands, avoid the larger tour groups. The many small volcanic islands also make for some excellent trekking opportunities with some incredible views of the surrounding area. 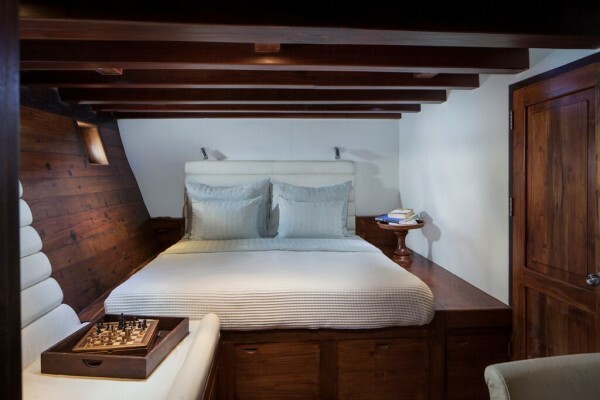 It's all about luxury and relaxation on board the Samata and we lapped up every second. 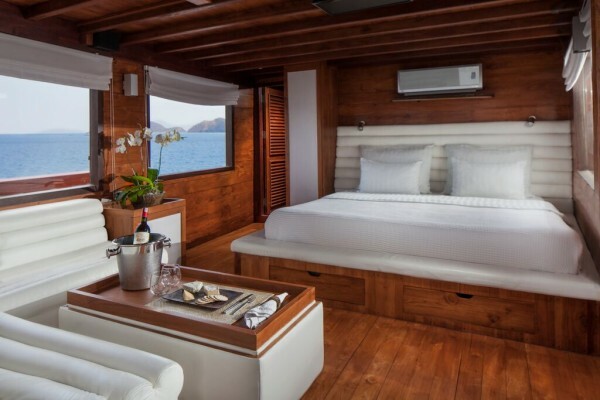 The Samata has 1 Master Suite and 4 Deluxe Suites. The Master is on the top deck with a king-sized bed, 270-degree views through the cabin’s wraparound windows and its own large private sun deck. This is perfect for honeymooners and couples celebrating an anniversary or a special occasion. Each of the 4 luxurious Deluxe Suites has a queen-sized bed and magnificent en-suite bathroom with private hot-water shower. They are decorated with a beautiful hardwood finish, with ample wardrobe and storage space. 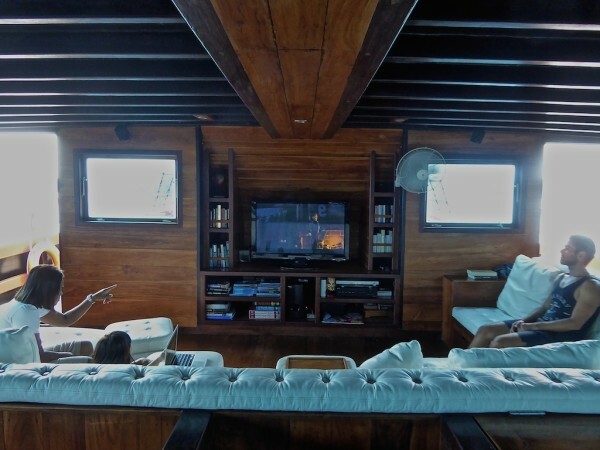 The Samata has a lounge and entertainment area with large flat-screen TV, hundreds of on-demand movies, board games, a library of books, all geared to having a relaxing and romantic evening. Or, you can just watch Frozen over and over again if like Sebastien you want to sing along with Elsa every evening. The Samata has an excellent sun deck area on top for relaxing and topping up the summer tan. It's also a really romantic spot to catch the many beautiful sunsets you will be spoilt with every evening. The Samata is all yours and unlike other luxury cruises we've been on, everything is included with no extras to pay. 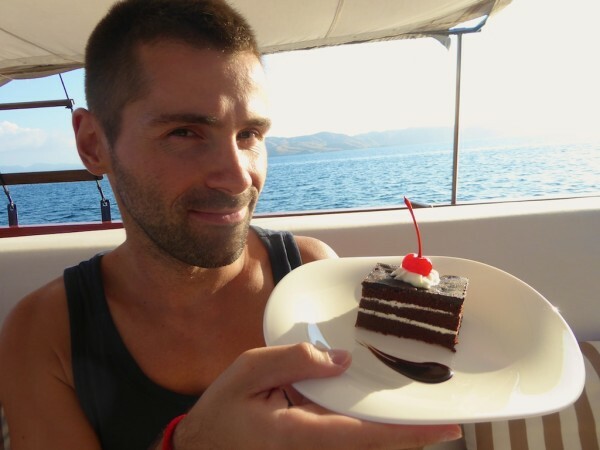 This includes all meals, a huge variety of alcohol, scuba diving, equipment for snorkelling and diving, excellent coffee machine (coffee loving Stefan was in paradise) and all fees like National Park entrance fees. 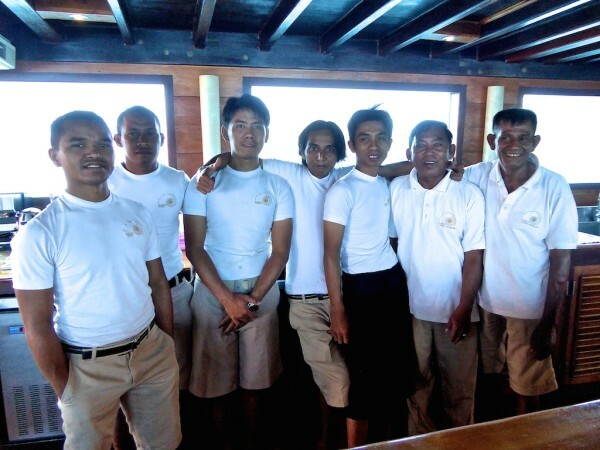 The staff on board the Samata offer an extremely high level of service, not intrusive, but helpful in every way. No request is too great for anyone and we felt extremely welcomed as a gay couple. The cost of chartering a liveaboard experience in the Komodo National Park or in Raja Ampat on the Samata for 2016 is $3,800 for 2 guests per day and $250 (per day) for each additional guest, plus 10% tax. This includes all diving, food, drinks (alcoholic as well), land excursions, park/conservation fees and transfers to/from the airport to the yacht. To book your dream liveaboard experience on the Samata, contact Michael Kick, details of which can be found on the Samata's website. My boyfriend and I are planning for a same trip this summer. $3800 for 2 guests per day is a good price for that service. Thank you for sharing Stefan. 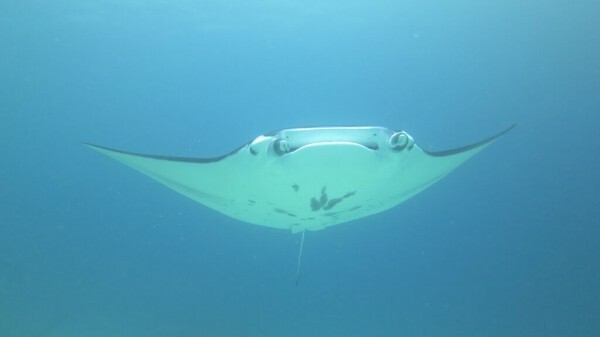 Indonesia is famous for having some of the best diving in the world, particularly due to its location.As enthusiastic scuba divers, we just had to come visit and swim with the turtles, sharks, parrot fish, clown fish, manta rays, surgeon fish, barracudas, trigger fish, and moray eels. Oh it was amazing. 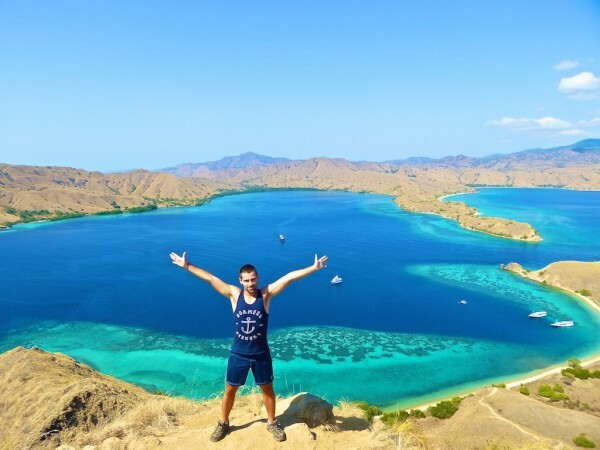 The Komodo National Park is totally worth it – one of the highlights of Asia for us. Wow, what amazing stay and that ship is stunning, I would love to be pampered like this! Ypur posts are always useful and fun! I love your pictures and your prose as well. It’s always fun reading you. I really love and enjoy your blog, guys. I really do. It looks amazing and your photos are beautiful! Oh yes yes Aditi it was AMAZING! !